It’s a cliché to say that if you enjoyed a band’s previous work, you’ll enjoy this new record…But in the case of Passion Pit’s latest Kindred, you really will. Solo artist Michael Angelakos a.k.a. Passion Pit is staying true to style and spirit in his new album. It’s a record that’s very aesthetically pleasing in the ears and while it lacks some of the emotional grounding of previous albums, Kindred is on point with the actual technical aspects of music. Appealing synths and ever-so-slightly mechanical vocals combine with hazy swirly background sound in some skilful pop tracks. “Whole Life Story,” while perhaps a little bit forced, is probably the catchiest of the lot, except for maybe opening track “Lifted Up (1985).” “Until We Can’t (Let’s Go)” is in much the same vein, as is “All I Want…” Aw damn, they’re all catchy. 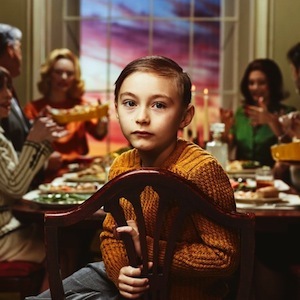 It’s an album of pretty pop-tastic radio friendly tracks – as said, without the emotional rawness of some other Passion Pit tunes, but all the same top-notch pieces of music making. “My Brother Taught Me How To Swim” is probably the most emotionally resonant with its drawn out vocals and harmonies – competing with a slightly discordant synth choir. “Dancing on the Graves” is a quieter, slower, and more melancholy track, as Angelakos laments “I can’t stay here…” against an ambient backdrop of piercing haze and drones. Then there’s the sentient-robot-voice of final track “Ten Feet Tall (II),” autotuned to the max with a rising crescendo to crash the album to a finish that’s both abrupt and oddly final. It seems a little out of place with the rest of the album, but it sure makes for a dramatic exit. Though it’s been nearly three years since his last full-length release, Kindred is in some ways designed to continue the narrative of previous albums Manners and Gossamer. In that respect, it doesn’t quite hold up to its forbearers. It’s briefer and more concise, but it doesn’t really bring anything new to the table. The three years since his last release have been difficult ones for Angelakos – with the singer openly discussing his struggles with bipolar disorder – and it’s good to see his music-making going strong. But with a technical skill as good as this, here’s hoping we see Passion Pit shift out of the pop comfort zone and back in the direction of experimentation and that raw emotional edge.